Getting to Madejski Stadium is extremely simple with excellent links to all transport networks. From Junction 11 of the M4, follow signs towards Reading. The Madejski Stadium is well sign-posted and is on your left-hand side after less than a mile. The nearest rail station is Reading around two miles away. From there take a bus/taxi to the stadium. Catch the number 79 "Football Special" bus from outside the main railway station (also called the Reading Station Shuttle). If you walk out of the main entrance you'll see buses leaving from just along opposite the road entrance to the Three Guineas Station pub (stop SQ). Number 79 buses run every 15 minutes from a couple of hours before the kick-off and take roughly 15 minutes to get to the ground. The number 79 bus service is shared between home and away fans travelling to and from the ground from town. The return journey leaves frequently after the final whistle from the layby down the hill away from the North side of the ground. Adult single £2.50, Child single £1.00, Adult reurn £3.00, Child return £1.50. Black cabs can be found at the large taxi rank outside Reading Train Station and should cost around £9 to get to the stadium. Allow a little longer than the bus as they can't use the bus lanes in Reading. The nearest airport is London Heathrow. From there, you can take the RailAir bus direct to Reading train station and then a bus. This involves a short bus ride to and from the stadium. Fares on return bus shuttle are £3 adult return and £1.50 child return. 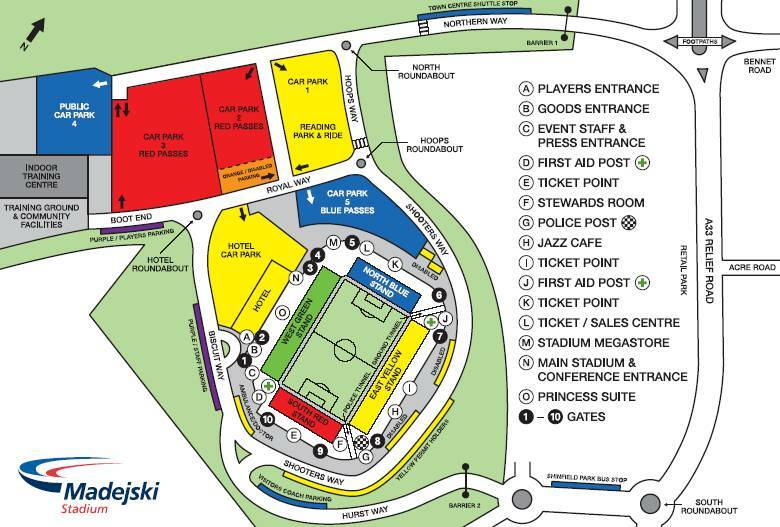 Directions: from J11, M4, take exit B3270 (signposted Earley) and follow yellow signs to "Match Reading FC Park & Ride ". This is the best option for away supporters. Three minutes walk to the stadium. Directions: from J11, M4, proceed towards Reading along the A33 dual carriageway, past the Madejski Stadium and past B&Q retail park. Straight ahead at traffic lights on gyratory roundabout, past Green Park turning and take the next left. Normally full 1 hour before kick off. Five minutes walk to the stadium. Directions: from J11, M4 motorway, drive towards Reading along the A33 dual carriageway, turn right at the 1st roundabout. Normally full 30 minutes before kick off. Five minutes walk to the stadium. The car park is on Bennet Road, opposite the Jaguar garage. This will be our first visit to the Madejski Stadium. We've never faced Reading in our history which given they were formed in 1871 and we followed in 1892 is pretty remarkable. As such we also missed out on a visit to their old stadium Elm Park which Reading left after 102 years in 1998. If you want a bit of history though pop along to the Spread Eagle pub which sat directly opposite the turnstiles for the home end - the walls are still covered in Reading memorabilia and they run a free bus to Saturday games. The Madejski itself is a modern bowl which last season was apparently voted the best stadium in Europe with a capacity below 30,000! The design allows the outside of the stadium, the inner concourse with bars and food outlets and the entrances into the seating area to all be on the same level, giving superb disabled access. The town of Reading has expanded rapidly with the IT and insurance services ranking highly among local employers. It's also an important computer town for London being only 25 minutes from Paddington by train. Heathrow is 35 minutes down the motorway on a good day. With the boom in economic fortunes the centre has undergone a rapid transformation and what once was an arid wasteland when it came to entertainment is now filled with the same chain pubs you'd see in most towns and cities. The traditional rivalry for Reading's fans has been with Swindon and Oxford. The fanzine was named The Whiff after the horrible smell which emanated from the sewerage works in south Reading, which if the wind was blowing in the wrong direction engulfed the Madejski. Thankfully a new sewerage works opened in 2004 alleviating this pungent problem. The Madejski is situated in the south of Reading near the M4 in an industrial estate. As a result pubs nearby are extremely limited and there's no designated away pub for a pre-match sing-along. The closest pubs within walking distance are the Post House (which you won't get in) and the Harvester on Basingstoke Road (the old A33) which is more of a family pub. Away fans are located in the South Stand (turnstile gates 9 & 10) behind one goal: capacity up to 2,327. Underneath the seating bowl you'll find concourse bars serving food and ale. The Madejski is a new stadium with an all-seater fully covered bowl. Views, comfort and leg room are all excellent. N.B. Smoking is not permitted in the South Stand and smokers are not permitted to leave or re-enter the Stand. Parking is absolutly dreadful, people just park on the sides of the roads which the local traffic wardens love. I actually work in Reading ind if you want to park close to the ground (10mins walk) ask someone for directions to Gillette. I work there and we have a small car park in front of our building which is always covered by cctv, we don't charge anything for parking. Thoughts from people that went yesterday? Found it dead easy to park by the ground then walked about 2 mins down the road to Holiday inn where there was a decent size boozer on the side. Was quite pricey but was only there for 3 or 4 pints so was sound. Only short walk from ground to. Getting in was crap, not used to having the majority of fans turning up in the last 30 minutes. Fine once you got to the stewards checking tickets 5 yds from turnstyle. Major problems about 2.55pm which i missed by minutes as due to the amount of people and crap stewarding / policing they deceided to close turnstyles and send the horses in to clear the area. Muppet policing, of which the Merseyside plod agreed with and thay have already put a complaint in via Ged Poynton. I was listening to Alan Greens phone in on five live last night and a liverpool fan called and said it was a disgrace the way the stewards and police there handled the crowd while they waited to get in. His main grief was the lack of turnstyles and the automated ticket access because the ticket never gave the info on which way to put it in the machine to open turnstiles and there where no stewards to assist you which caused a delay getting in and those that where around where none to helpful, and held up the crowd more because they complained. The caller got the sympathy from Alan Green but I heard no more callers confirming his version on the phone in last night did anyone else have similar problems getting in at reading? Yep and i know the lad who phoned. No signs to advise how to work the turnstyles and delays caused by that made the crowd build up worse. Considering i can walk to my turnstyle at Anfield 5 mins before start and have time for a piss and get to seat before kickoff says a lot. Must have assumed we got in the same way, infact slower than getting an operator tearing the stub off. I wasn't happy hearing about the pregnant girl almost getting crushed by a police horse or what sounded like you do as we say when we say attitude from the stewards or from the guys phone in report gave the impression they where out to make a name for themselves (pushing the big guys around sort of thing) but I could be totally wrong as I'm going off the radio report, but something must be amiss or the guy wouldn't have called up national radio to air his views. parked just off basingstoke Rd. and got in dead easy, i went in early though, and heard off a few lads it was a bit of a nightmare later on. It says on the back of my ticket, "Please note: automated turnstiles operate at the stadium", but otherwise no written/picture instructions as to use of the turnstile. I watched the person in front insert his ticket so at least I figured that part out but the reader gave no obvious indication that my ticket had registered. At least there were stewards at 2.45 - I had intended to get to the ground earlier, it being the first visit, but the walk took longer than I thought. There appeared to be 4 turnstiles at Gate 9 (don't know how many at Gate 10) for Away fans and the stewards were frisking a number of fans, which caused a delay. Half-time refreshments were a similar price to Anfield but it took so long to get served that many of us missed the equalising goal. Seats had plenty of leg-room. Apart from all that, it was a good end-to-end game (on the sandy beach that passed for their pitch, but what do you expect sharing it with a rugby club?). Deffo worth the visit though. When the final whistle went, a bloke in front of us was so happy he turned round and was hugging and kissing several of us. Listening to Reading Radio post-match interview, the interviewer said to Coppell, "So Steve, that's the 7th straight defeat", to which he replied, rather annoyed, "Yea, thanks for reminding me of that." Must have missed all the hassle outside to be honest. There was a bit of a queue to get into the turnstyles but nothing out of the ordinary , think it was about 20/30 mins before kick off, steward at the turnstyle was telling people which way to put the ticket into the reader and I think most noticed the red light changing to green when it had been accepted, although the woman in front of me didn't realise until I pointed it out. No beer was available until the half time whistle went which was frustrating a few people who had gone early to miss the rush. After the match we got on the 79 soccerbus into town with no hassle at all gave the driver a quid because we didn't have a ticket but seemed like most were just walking on. Overall as most people have said a decent stadium but a sand pit for a pitch. Few good boozers in Reading, and a taxi from the town centre'll cost you less than a tenner. £6 we usually pay. Fair price considering it's a 10 minuite drive at least. This was a great day, nice stadium but poor pitch (mainly because London Irish rugby club use it as-well). We had to use an electronic scanner for our tickets at the turnstile, some people didn't know how to use them which caused a small delay getting into the ground. Leg room and seats were fine, I had a great time, apart from some nob head Reading fans at the end who kicked off, apparently we are not allowed to celebrate when our team scores. Should be getting to reading about 6 tomorrow. Are there any boozers near the ground at all, what with it being another out-of-town retail park style location and all. It's crap around the ground i thought. There is a bar at the Holiday Inn nearby or there is a pub about 15 mins from the ground on the old basingstoke road near the Gillette factory. what time and where are most reds heading before the game. i should be getting there about 6pm and dont know where to go. im getting dropped of by the ground. Town centre basically! As the lads said, if you really can't make it into town before the game, then there's the Harvester on the Basingstoke Road. Find the Gillette building and go up the hill a bit on the opposite side of the road - about 20 minutes' walk from the stadium. If not, try the Holiday Inn again on Basingstoke Road. From J11, follow A33 towards Reading and then turn right after 200 yards towards (signposted) Whitley. Follow the road then round to the left as opposed to coming back on yourself towards the motorway. After about quarter of a mile you reach a roundabout - take the first exit and the hotel is IMMEDIATELY on your right. We parked in the Holiday-Inn. They have security on the entrance but if you can blag that you've got a room they'll let you in. Quite cheap beer in there too. Any updates from any one? Can someone remind us to remove this after the game> Cheers, thanks ta. If your going on the train buses are running from the station to the stadium from 3.15pm and will be leaving the ground for about 40 minutes after full time. Cost is £3.50 Adult £2.00 child. Is that the 79 bus still and are those prices singles or returns? Go Robbie, Go Robbie, Go! Anyone got any ideas for this one in a couple of weeks?